Dromore 1st XV overcame Belfast Harlequins’ 2s 34-26 on a mild Saturday afternoon at Barban Hill. From the kick off, Dromore started at a ferocious tempo and Quins struggled to cope. While an early penalty attempt from Ryan Cobb sailed just wide, the resulting drop out went straight into touch. They opened the score minutes later through lock, Stuart Russell. TJ Morris’ conversion was unsuccessful and left the score 5-0 to the hosts. The second try was scored shortly after. A combination of powerful running from Adam Macgregor and swift hands from Samuel Russell resulted in Aaron Stewart crossing in the corner. The score remained 10-0 as the conversion was missed. Excellent awareness from the Dromore backs scored the third try minutes later. Switching the play to go blind, left a three on one overlap and a dummy from out half Ryan Cobb gave Dromore the try. 15-0 to the hosts. The fourth followed after Brian McClearn intercepted a pass from Harlequins. The conversion was successful and gave the home side a 22-0 lead with no more than 20 minutes played. Dromore dominated the possession as well as the territory and the Belfast side struggled to find answers as they threatened to run riot. Runs from Andy Black caused havoc in the Quins’ ranks while McClearn and Michael Allen were finding space out wide. Harlequins had their first meaningful attack after the half hour mark when a series of penalties allowed them into the 22 for the first time. Dromore’s lineout defence was good with Ryan Hughes often disrupting the set piece. After a promising build up and several line breaks John Cullen turned the ball over and Dromore nearly added to their 4 tries when Cullen broke the line and had the defence at sixes and sevens but a knock on ended the move. Quins got their first try after sustained pressure on Dromore. Having committed much of the defence through several tight phases of play, a ball was thrown wide and allowed the full back to score in the corner. 22-5 to the hosts at the interval and a lead that was fully deserved. Dromore started the second half with the same intensity that they started the first. Slick hands from Cobb and dummy lines from John Russell left a gap for McClearn to run through, so good was the line that the support struggled to keep up and he was penalised for holding on. Harlequins offered some resistance to the Dromore surge and they began to grow into the game with more possession. The second half certainly was more competitive with both sides looking dangerous on attack. Against the run of play Quins got their second try of the game and decreased the gap to 10 points after an intercepted pass. Despite being caught by a Dromore defender, the ball was recycled and the fullback strolled in under the posts. 22-12. The Quins reduced the deficit to just 3 points with another try after some poor tackling from Dromore. The game was on a knife edge and with the visitors camped inside the 22, superb work in the ruck helped reduce some of pressure. 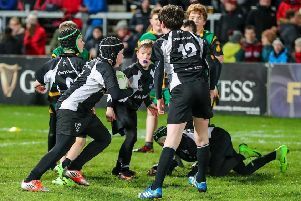 The comeback was complete when the openside flanker got the ball on half way and a jinking run beat several defenders and ran under the sticks. Again, poor tackling was Dromore’s undoing. 26-22 to the away side. McClearn added another score after a break from Macgregor and gathering his box to rim in under the posts. Morris added the conversion. 34-26 to the hosts. Aaron Stewart saved Dromore’s blushes with a terrific tackle that prevented Quins from regaining the lead. That was to be the last of the action and the referee blew an exhilarating game to a close. 34-26 to Dromore.